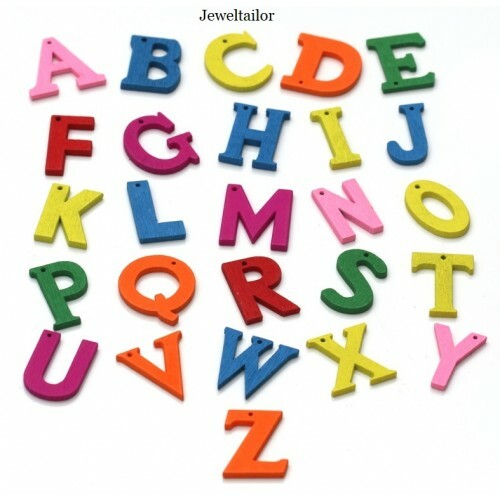 These vibrantly coloured letter beads are available in letters A-Z, are 100% lead free and large enough to be used in a range of projects from jewellery making to art. Each alphabet bead measures approximately 20mm x 3.5mm thick with a 1mm hole and are available in a randomly selected range of colours. How To Order? Type only 1 chosen initial into the text box provided then add the item to your basket prior to checkout. To purchase multiple, different initials, add each one separately to your basket and change quantities as desired. This product is recommended for children aged 3+ with adult supervision and is CE safety approved for your peace of mind. These mixed coloured alphabet beads are perfect for creating bespoke gift tags, door signs or for use in projects such as jewellery making, card making, scrap booking and arious other artistic projects.